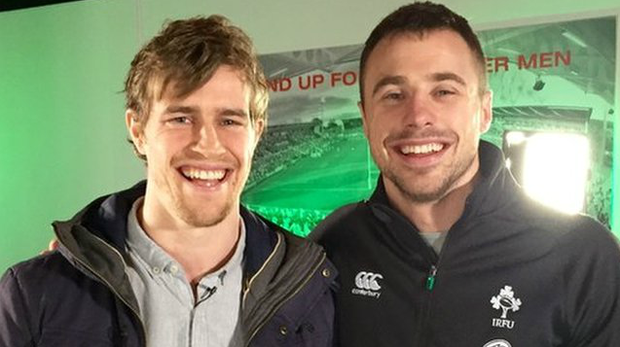 Before last weekend's Six Nations triumph, last year's IRUPA Player of the Year Andrew Trimble caught up with Tommy Bowe to discuss his wedding, the World Cup and the Six Nations. Bowe looked prepared for a serious interview but it was quite clear from the off that Trimble had other things in mind. The 'new Gary Lineker' (as Bowe called) him let rip at Bowe over his lack of tries and upcoming nuptials in a hilarious interview. Trimble: "The BBC got in touch with me a few weeks back and they wanted me to have a chat with Monaghan's favourite son, unfortunately Barry McGuigan wasn't available, but we do have Tommy here. "You're keeping that Irish jersey warm for me. "I'm obviously injured at the minute so you're getting more opportunities than you would have got in other years. " Bowe: "I appreciate that thank you." Trimble: For me, I look back at last year and I scored a try against Italy, scored a try against Scotland, against France... tell us about your tries in this year's Six Nations..."
Bowe: "With all those easy lines that you kept hitting, the teams are obviously aware of those, so they haven't really been opening up for me. "The tries certainly haven't been as freeflowing as your run-ins last year. Trimble: "It's also exciting looking forward to your wedding, you're getting married to Lucy in June, how are the wedding preparations getting on?" Bowe: "We're really excited by it, it's going to be a good day and hopefully a lot of my good friends will be there... including yourself." Trimble: "Why am I not best man? Bowe: "You were in the running, in fairness, until whenever I was out injured and missed all the Six Nations last year... all that gloating you were doing, 'who's Tommy Bowe? This is my jersey forever'... you burnt your bridges there a wee bit." Trimble: "Is there any truth in the rumour that Joe Schmidt is in your wedding party?" Bowe: "Joe Schmidt is in the running for best man at the minute." Trimble: "Being a winger is unfortunate, there's a lot of competition. Come World Cup time, there is every chance I'll be on the right but do you think you'll get that left wing position?" Bowe: "You'll have the right wing slot nailed down, it's going to be a shoot off for who is going to be on that left wing. I'm going to have my work cut out but if you can put in a good word for me with Joe and the coaching staff. I'd really appreciate that." Trimble: "You've recently turned 31, now that you're getting on a little bit, I wonder would it be more of an idea for you to move into a coaching role and let myself and Gilroy, the young fellas, develop?" Bowe: "It is something that I've thought about but being 31, I spoke to Paddy Wallace and he said his best years were in his 30s so that gave me confidence that I've got a few more years left in me yet."